also known as Multithreaded Search or SMP Search, is a way to increase search speed by using additional processors. This topic that has been gaining popularity recently with multiprocessor computers becoming widely available. Utilizing these additional processors is an interesting domain of research, as traversing a search tree is inherently serial. Several approaches have been devised, with the most popular today being Young Brothers Wait Concept and Shared Hash Table aka Lazy SMP. This page gives a brief summary of the different types. SMP algorithms are classified by their scalability (trend in search speed as the number of processors becomes large) and their speedup (change in time to complete a search). Typically, programmers use scaling to mean change in nodes per second (NPS) rates, and speedup to mean change in time to depth. Scaling and scalability are thus two different concepts. 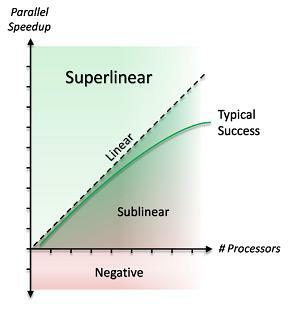 A subtype of parallel algorithms, distributed algorithms are algorithms designed to work in cluster computing and distributed computing environments, where additional concerns beyond the scope of "classical" parallel algorithms need to be addressed. This technique is a very simple approach to SMP. The implementation requires little more than starting additional processors. Processors are simply fed the root position at the beginning of the search, and each searches the same tree with the only communication being the transposition table. The gains come from the effect of nondeterminism. Each processor will finish the various subtrees in varying amounts of time, and as the search continues, these effects grow making the search trees diverge. The speedup is then based on how many nodes the main processor is able to skip from transposition table entries. Many programs used this if a "quick and dirty" approach to SMP is needed. It had the reputation of little speedup on a mere 2 processors, and to scale quite badly after this. Recent improvements by Daniel Homan  , Martin Sedlak  and others on Lazy SMP indicate that the algorithm scales quite well up to 8 cores and beyond  . ABDADA, Alpha-Bêta Distribué avec Droit d'Aînesse (Distributed Alpha-Beta Search with Eldest Son Right) is a loosely synchronized, distributed search algorithm by Jean-Christophe Weill  . It is based on the Shared Hash Table, and adds the number of processors searching this node inside the hash-table entry for better utilization - considering the Young Brothers Wait Concept. These algorithms divide the Alpha-Beta tree, giving different subtrees to different processors. Because alpha-beta is a serial algorithm, this approach is much more complex. However, these techniques also provide for the greatest gains from additional processors. In Principal Variation Splitting (PVS), each node is expressed by a thread. A thread will spawn one child thread for each legal move. But data dependency specified by the algorithm exists among these threads: After getting a tighter bound from the thread corresponding to the PV node, the remaining threads are ready to run. The idea in Feldmann's Young Brothers Wait Concept (YBWC)   as well in Kuszmaul's Jamboree Search    , is to search the first sibling node first before spawning the remaining siblings in parallel. This is based on the observations that the first move is either going to produce a cutoff (in which case processing sibling nodes is wasted effort) or return much better bounds. If the first move does not produce a cut-off, then the remaining moves are searched in parallel. This process is recursive. Since the number of processors is not infinite the process of "spawning" work normally consists in putting it on some kind of "work to be done stack" where processors are free to grab work in FIFO fashion when there is no work to do. In YBW you would not "spawn" or place work on the stack until the first sibling is searched. In their 1983 paper Improved Speedup Bounds for Parallel Alpha-Beta Search  , Raphael Finkel and John Philip Fishburn already gave the theoretical confirmation to the common sense wisdom that parallel resources should first be thrown into searching the first child. Assuming the tree is already in an approximation to best-first order, this establishes a good alpha value that can then be used to parallel search the later children. The algorithm in the 1982 Artificial Intelligence paper  , which Fishburn called the "dumb algorithm" in his 1981 thesis presentation  gives p^0.5 speedup with p processors, while the 1983 PAMI algorithm (the "smart algorithm") gives p^0.8 speedup for lookahead trees with the branching factor of chess. This algorithm, invented by the Cray Blitz team (including Robert Hyatt  ), is the most complex. Though this gives the best known scalability for any SMP algorithm, there are very few programs using it because of its difficulty of implementation. Many different approaches have been tried that do not directly split the search tree. These algorithms have not enjoyed popular success due to the fact that they are not scalable. Typical examples include one processor that evaluates positions fed to it by a searching processor, or a tactical search that confirms or refutes a positional search. During an parallel search, certain areas of memory must be protected to make sure processors do not write simultaneously and corrupt the data. Some type of semaphore system must be used. Semaphores access a piece of shared memory, typically an integer. When a processor wants to access protected memory, it reads the integer. If it is zero, meaning no other process is accessing the memory, then the processor attempts to make the integer nonzero. This whole process must be done atomically, meaning that the read, compare, and write are all done at the same time. Without this atomicity another processor could read the integer at the same time and both would see that they can freely access the memory. In chess programs that use parallel alpha-beta, usually spinlocks are used. Because the semaphores are held for such short periods of time, processors want to waste as little time as possible after the semaphore is released before acquiring access. To do this, if the semaphore is held when a processor reaches it, the processor continuously reads the semaphore. This technique can waste a lot of processing time in applications with high contention, meaning that many processes try to access the same semaphore simultaneously. In chess programs, however, we want as much processing power as possible. Spinlocks are sometimes implemented in assembly language because the operating system does not have an API for them. There are two ways of utilizing the extra processing power of multiple CPUs, threads and processes. The difference between them is that threads share all memory in the program, but there are multiple threads of execution. In processes, all memory is local to each processor except memory that is explicitly shared. This means that in a threaded program, functions must pass around an extra argument specifying which thread is active, thus which board structure to use. When using processes, a single global board can be used that will be duplicated for each process. Threads are more common, because they are easier to debug as well as implement, provided the program does not already have lots of global variables. Processes are favored by some because the need to explicitly share memory makes subtle bugs easier to avoid. Also, in processes, the extra argument to most functions is not needed. Raphael Finkel, John Philip Fishburn (1980). Parallel Alpha-Beta Search on Arachne. IEEE International Conference on Parallel Processing, pp. 235-243. Selim Akl, David T. Barnard, R.J. Doran, (1980). Design, analysis and implementation of a parallel alpha-beta algorithm, Department of Computing and Information Science, Queen's University, Kingston, Ontario. Selim Akl, David T. Barnard, R.J. Doran (1980). Simulation and Analysis in Deriving Time and Storage Requirements for a Parallel Alpha-Beta Pruning Algorithm. IEEE International Conference on Parallel Processing, pp. 231-234. Selim Akl, David T. Barnard, R.J. Doran (1980). Searching game trees in parallel, Proceedings of the Third Biennial Conference of the Canadian Society for Computational Studies of Intelligence, Victoria, B.C. Selim Akl, R.J. Doran (1981). A comparison of parallel implementations of the alpha-beta and Scout tree search algorithms using the game of checkers, Department of Computing and Information Science, Queen's University, Kingston, Ontario. Monroe Newborn, (1982). OSTRICH/P - a parallel search chess program, SOCS-82.3, McGill University, School of Computer Science, Montreal. Monroe Newborn (1985). A Parallel Search Chess Program. Proceedings of the ACM Annual Conference, pp. 272-277. Denver, Co.
Jonathan Schaeffer (1986). Improved Parallel Alpha-Beta Searching. Proceedings ACM/IEEE Fall Joint Computer Conference, pp. 519-527. Hiromoto Usui, Masafumi Yamashita, Masaharu Imai, Toshihide Ibaraki (1987). Parallel Searches of Game Tree. Systems and Computer in Japan, Vol. 18, No. 8, pp. 97-109. Jonathan Schaeffer (1988). Distributed Game-Tree Searching. Journal of Parallel and Distributed Computing, Vol. 6, No. 2, pp. 90-114. Monroe Newborn (1988). Unsynchronized Iterative Deepening Parallel Alpha-Beta Search. IEEE Transactions on Pattern Analysis and Machine Intelligence, PAMI, Vol. 10, No. 5, pp. 687-694. ISSN 0162-8828. Robert Hyatt, Bruce W. Suter, Harry Nelson (1989). A Parallel Alpha-Beta Tree Searching Algorithm. Parallel Computing, Vol. 10, No. 3, pp. 299-308. ISSN 0167-8191. Robert Hyatt (1994). The DTS high-performance parallel tree search algorithm. This page was last edited on 5 March 2019, at 20:35.